Microsoft just completed its makeover of Office Web Apps, adding improved touch support for phones and tablets and a modern sheen to complement the upcoming Windows 8. The improvements have been available as a preview since July, and Microsoft says more than 750,000 users opted in to test the new apps. Now, the new look for Office Web Apps is available to all users through SkyDrive and Outlook.com. 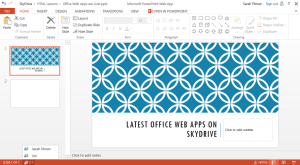 The look and feel for these apps is similar to that of Office 2013, with a ribbon of options across the top of the screen and the same modern fonts and sharp angles dividing each section. And much like Office 2013, the new Office Web Apps also have some light improvements for tablets. Microsoft also claims that performance is improved, and documents now render 30 percent faster in Office Web apps. I didn't test that claim, but the online version of Word felt zippy enough on an iPad and a Chromebook. Although the Web version of Office lacks many of the advanced features of the desktop software, such as ruled margins and the ability to track changes, Microsoft promises "fidelity" between the two versions, so there's no loss of compatibility. Update: Just to be clear, desktop Word documents with existing tracked changes will appear in the Web version, but if the document was created in the browser, there's no way to add new tracked changes through Office Web Apps. And of course, unlike desktop Office, the Web version is free. With the latest improvements, the apps are a fine choice for basic document editing across multiple devices, especially if you're running SkyDrive on a PC to keep your files in sync.